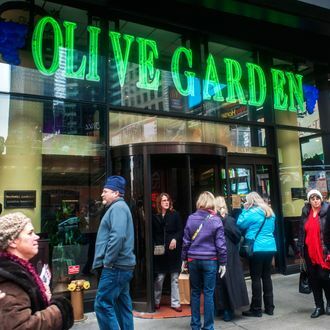 A hilarious Reddit post is going viral because it asks people to defend why they voluntarily ate at the Times Square Olive Garden. For the uninitiated: This is a serious question many New Yorkers have, so the immense popularity of a post on the “AskReddit” subreddit titled, simply, “Redditors who have eaten at the Times Square Olive Garden, why?” is pretty obvious. Certain locals would argue that the restaurant epitomizes New York City at its worst — a Times Square landmark famous for no reason beyond its ability to trick out-of-towners into paying three times more to eat at a chain they almost certainly have back home, the equivalent of traveling to Mexico and dining on Taco Bell. In terms of sheer objective outrage, it may fail to beat Guy’s American Kitchen, but it’s still regarded as one of the worst dining decisions a person can make in New York, especially if the person is a time-strapped tourist. And yet, it’s probably the world’s largest Olive Garden, and remains chronically packed. The Reddit post, by user nefftron, went up early Sunday evening, and had already coasted past the 11,000-comment mark early Monday. Here are some of the best defenses people have submitted so far, though it’s worth noting that this is based on a not-at-all-exhaustive examination — wade in on your own (which is highly recommended), and you may turn up even better gems. Tourist. Jet lagged. Hungry. Overexcited about being in NY. Slightly intimidated by the whole thing. Really hungry. Lived in NYC for five years and sometimes we got suburb home sick. It was an easy medicine. Plus … free refills! Went to college in NYC during Hurricane Sandy. With the power out for a few days after, my roommates and I went out looking for food and electricity (midtown still had power). We convinced ourselves that the Times Square Olive Garden was a better option than fighting for outlets in an ATM vestibule. $25 for 4 hours of charging my phone, unlimited breadsticks, and drinks. Marginally worth it. 3/5 would do it again next hurricane. LOL. Because my kids were being tired jerks after a day of sightseeing and it didn’t have a 90 minute wait. We were all disappointed in our meals though, and I felt remorse for taking the easy way out. I was on a school trip and I’m assuming it was the cheapest option for 100 kids to eat. I have a buddy who goes there when he is breaking up with someone. He doesn’t want to ruin any other restaurants.